Introducing the next generation Velux SUN TUNNELTM skylight – the most innovative tubular skylight in the industry, with a new product design that delivers brighter/whiter natural light than ever before. All SUN TUNNELTM skylights consist of UV resistant acrylic domes, one-piece roof flashing, reflective tubing, and ceiling housings with acrylic diffusers. Models with rigid Miro-Silver aluminum or flexible tubing are available for use in residential and commercial installations. Velux SUN TUNNELTM skylights are perfect for any room where a view to the outside is not needed or where glass skylights are not an option due to space or construction limitations. 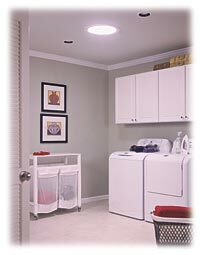 In residential applications, SUN TUNNELTM skylights with rigid tubing are available in 10″ and 14″ diameter sizes. The amount of light transmitted depends on many factors, including the roof orientation, tunnel length and angles, time of day, and season of the year. Generally, the 10″ size is best for lighting areas up to 10′ x 10′ while the 14″ is ideal for larger spaces. 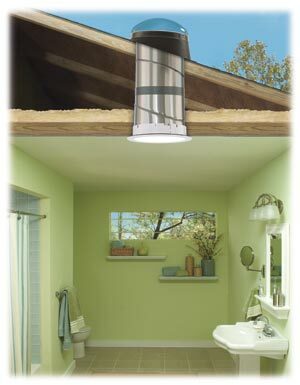 Optional light kits mounted inside the tube can turn the SUN TUNNELTM into an electric light for non-daylight lighting.